Patients' self-care behaviour plays a key role in the management of their diabetes. Through effective diabetes self-management the chance of acute and chronic complications can be considerably reduced. 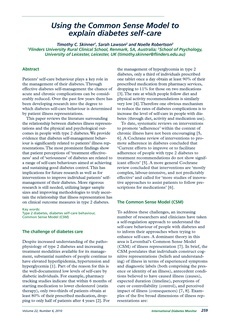 Over the past few years there has been developing research into the degree to which diabetes self-care behaviour is determined by patient illness representations. This paper reviews the literature surrounding the relationship between diabetes illness representations and the physical and psychological outcomes in people with type 2 diabetes. We provide evidence that diabetes self-management behaviour is significantly related to patients' illness representations. The most prominent findings show that patient perceptions of 'treatment effectiveness' and of 'seriousness' of diabetes are related to a range of self-care behaviours aimed at achieving and sustaining good diabetes control. This has implications for future research as well as for interventions to improve individual patients’ self-management of their diabetes. More rigorous research is still needed, utilizing larger sample sizes and improving methodologies to truly ascertain the relationship that illness representation has on clinical outcome measures in type 2 diabetes.